Hokkaido (北海道, Hokkaidō, literally "Northern Sea Circuit"; Japanese pronunciation: [hokːaꜜidoː] ( listen), Ainu: アィヌ・モシリ aynu mosir), formerly known as Ezo, Yezo, Yeso, or Yesso, is the second largest island of Japan, and the largest and northernmost prefecture. The Tsugaru Strait separates Hokkaido from Honshu. The two islands are connected by the undersea railway Seikan Tunnel. The largest city on Hokkaido is its capital, Sapporo, which is also its only ordinance-designated city. About 43 km north of Hokkaido lies Sakhalin Island, Russia. 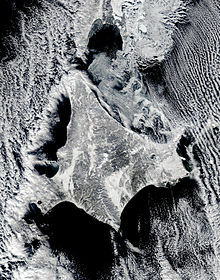 To its east and north-east are the disputed Kuril Islands. The Nihon Shoki, finished in 720 AD, is often said to be the first mention of Hokkaido in recorded history. According to the text, Abe no Hirafu led a large navy and army to northern areas from 658 to 660 and came into contact with the Mishihase and Emishi. One of the places Hirafu went to was called Watarishima (渡島), which is often believed to be present-day Hokkaido. However, many theories exist in relation to the details of this event, including the location of Watarishima and the common belief that the Emishi in Watarishima were the ancestors of the present-day Ainu people. During the Nara and Heian periods (710–1185), people in Hokkaido conducted trade with Dewa Province, an outpost of the Japanese central government. From the Middle Ages, the people in Hokkaido began to be called Ezo. Hokkaido subsequently became known as Ezochi (蝦夷地, lit. "Ezo-land") or Ezogashima (蝦夷ヶ島, lit. "Island of the Ezo"). The Ezo mainly relied upon hunting and fishing and obtained rice and iron through trade with the Japanese. During the Muromachi period (1336–1573), the Japanese created a settlement at the south of the Oshima Peninsula. As more people moved to the settlement to avoid battles, disputes arose between the Japanese and the Ainu. The disputes eventually developed into a war. Takeda Nobuhiro killed the Ainu leader, Koshamain, and defeated the opposition in 1457. Nobuhiro's descendants became the rulers of the Matsumae-han, which was granted exclusive trading rights with the Ainu in the Azuchi-Momoyama and Edo periods (1568–1868). The Matsumae family's economy relied upon trade with the Ainu. They held authority over the south of Ezochi until the end of the Edo period in 1868. The Matsumae clan rule over the Ainu must be understood in the context of the expansion of the Japanese feudal state. Medieval military leaders in northern Honshū (ex. Northern Fujiwara, Akita clan) maintained only tenuous political and cultural ties to the imperial court and its proxies, the Kamakura Shogunate and Ashikaga Shogunate. Feudal strongmen sometimes located themselves within medieval institutional order, taking shogunal titles, while in other times they assumed titles that seemed to give them a non-Japanese identity. In fact, many of the feudal strongmen were descended from Emishi military leaders who had been assimilated into Japanese society. The Matsumae clan were of Yamato descent like other ethnic Japanese people, whereas the Emishi of northern Honshu were a distinctive group related to the Ainu. The Emishi were conquered and integrated into the Japanese state dating back as far as the 8th century, and as result began to lose their distinctive culture and ethnicity as they became minorities. By the time the Matsumae clan ruled over the Ainu most of the Emishi were ethnically mixed and physically closer to Japanese than they were to Ainu. This dovetails nicely with the "transformation" theory that native Jōmon peoples changed gradually with the infusion of Yayoi immigrants into the Tōhoku rather than the "replacement" theory which posits that one population (Jōmon) was replaced by another (Yayoi). Leading up to the Meiji Restoration, the Tokugawa Shogunate realized there was a need to prepare northern defenses against a possible Russian invasion and took over control of most of Ezochi. The Shogunate made the plight of the Ainu slightly easier, but did not change the overall form of rule. Hokkaido was known as Ezochi until the Meiji Restoration. Shortly after the Boshin War in 1868, a group of Tokugawa loyalists led by Enomoto Takeaki temporarily occupied the island (the polity is commonly but mistakenly known as the Republic of Ezo), but the rebellion was crushed in May 1869. Ezochi was subsequently put under control of Hakodate-fu (箱館府), Hakodate Prefectural Government. When establishing the Development Commission (開拓使, Kaitakushi), the Meiji Government introduced a new name. 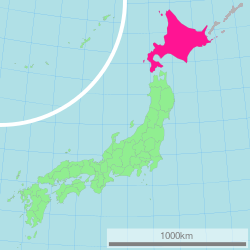 After 1869, the northern Japanese island was known as Hokkaido; and regional subdivisions were established, including the provinces of Oshima, Shiribeshi, Iburi, Ishikari, Teshio, Kitami, Hidaka, Tokachi, Kushiro, Nemuro and Chishima. The primary purpose of the development commission was to secure Hokkaido before the Russians extended their control of the Far East beyond Vladivostok. Kuroda Kiyotaka was put in charge of the venture. His first step was to journey to the United States and recruit Horace Capron, President Grant's Commissioner of Agriculture. From 1871 to 1873 Capron bent his efforts to expounding Western agriculture and mining with mixed results. Capron, frustrated with obstacles to his efforts returned home in 1875. In 1876, William S. Clark arrived to found an agricultural college in Sapporo. Although he only remained a year, Clark left a lasting impression on Hokkaido, inspiring the Japanese with his teachings on agriculture as well as Christianity. His parting words, "Boys, be ambitious! ", can be found on public buildings in Hokkaido to this day. The population of Hokkaido boomed from 58,000 to 240,000 during that decade. In 1882, the Development Commission was abolished. Transportation on the island was still underdeveloped, so the prefecture was split into several "sub-prefectures" (支庁 shichō), namely Hakodate Prefecture (函館県, Hakodate-ken), Sapporo Prefecture (札幌県, Sapporo-ken), and Nemuro Prefecture (根室県, Nemuro-ken), that could fulfill administrative duties of the prefectural government and keep tight control over the developing island. 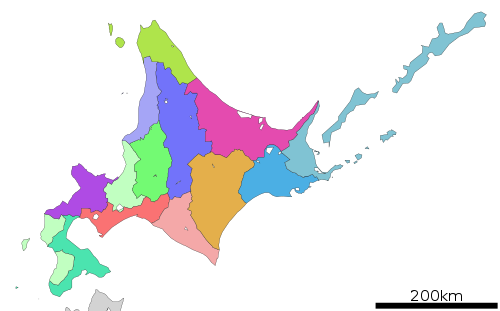 In 1886, the three prefectures were demoted, and Hokkaido was put under the Hokkaido Agency (北海道庁, Hokkaidō-chō). These sub-prefectures still exist today, although they have much less power than they possessed before and during World War II; they now exist primarily to handle paperwork and other bureaucratic functions. In mid-July 1945 shipping, cities and military facilities in Hokkaido were attacked by the United States Navy's Task Force 38. On 14 and 15 July aircraft operating from the task force's aircraft carriers sank and damaged a large number of ships in ports along Hokkaido's southern coastline as well as in northern Honshu. In addition, on 15 July a force of three battleships and two light cruisers bombarded the city of Muroran. Before the Japanese surrender was formalized, the Soviet Union made preparations for an invasion of Hokkaido, but President Harry Truman made it clear that the surrender of all of the Japanese home islands would be carried out by General MacArthur per the 1943 Cairo Declaration. Hokkaido became equal with other prefectures in 1947, when the revised Local Autonomy Law became effective. The Japanese central government established the Hokkaido Development Agency (北海道開発庁, Hokkaidō Kaihatsuchō) as an agency of the Prime Minister's Office in 1949 to maintain its executive power in Hokkaido. The Agency was absorbed by the Ministry of Land, Infrastructure and Transport in 2001. The Hokkaido Bureau (北海道局, Hokkaidō-kyoku) and the Hokkaido Regional Development Bureau (北海道開発局, Hokkaidō Kaihatsukyoku) of the Ministry still have a strong influence on public construction projects in Hokkaido. When establishing the Development Commission (開拓使, Kaitakushi), the Meiji Government decided to change the name of Ezochi. Matsuura Takeshirō submitted six proposals, including names such as Kaihokudō (海北道) and Hokkaidō (北加伊道), to the government. The government eventually decided to use the name Hokkaidō, but decided to write it as 北海道, as a compromise between 海北道 and 北加伊道 because of the similarity with names such as Tōkaidō (東海道). According to Matsuura, the name was thought up because the Ainu called the region Kai. Historically, many peoples who had interactions with the ancestors of the Ainu called them and their islands[dubious – discuss] Kuyi, Kuye, Qoy, or some similar name, which may have some connection to the early modern form Kai. The Kai element also strongly resembles the On'yomi, or Sino-Japanese, reading of the characters 蝦夷 (on'yomi as [ka.i, カイ], kun'yomi as [e.mi.ɕi, えみし]) which have been used for over a thousand years in China and Japan as the standard orthographic form to be used when referring to Ainu and related peoples; it is possible that Matsuura's Kai was actually an alteration, influenced by the Sino-Japanese reading of 蝦夷 Ka-i, of the Nivkh exonym for the Ainu, namely Qoy or IPA: [kʰuɣɪ]. 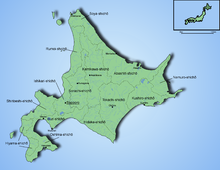 There is no known established Ainu language word for the island of Hokkaido. However, the Ainu people did have a name for all of their domain, which included Hokkaido along with the Kuril Islands, Sakhalin, and parts of northern Honshu, which was Aynu Mosir (アィヌ・モシリ), a name taken by the modern Ainu to refer to their traditional homeland. "Ainu Mosir" literally translates as "The Land Where People (the Ainu) Live", and it was traditionally used to be contrasted with Kamuy Mosir, "The Land of the Kamuy (spirits)". In the east, there are two areas (surrounding, for example, Shari and the Nakashibetsu Airport) where a grid with spacing of nearly 3 km is formed by narrow bands of forest. It was designed to buffer wind, especially during blizzards, to protect cattle. It also serves as habitat and transportation corridors for animals and hikers. On September 6, 2018, an earthquake of magnitude 6.6 affected the island; its epicenter was near the city of Tomakomai. Twelve prefectural natural parks (道立自然公園). The prefectural natural parks cover 146,802 ha, the largest area of any prefecture. There are three populations of the Hokkaido brown bear subspecies (Ursus arctos yesoensis). There are more brown bears in Hokkaido than anywhere else in Asia besides Russia. The Hokkaido brown bear is separated into three distinct lineages. There are only eight lineages in the world. Those on Honshu died out long ago. Native conifer species in Northern Hokkaido is the Abies sachalinensis (sakhalin fir) The Hydrangea hirta species is also located on this island. The northern portion of Hokkaido falls into the taiga biome with significant snowfall. Snowfall varies widely from as much as 11 metres (400 in) on the mountains adjacent to the Sea of Japan down to around 1.8 metres (71 in) on the Pacific coast. The island tends to see isolated snowstorms that develop long-lasting snowbanks, in contrast to the constant flurries seen in the Hokuriku region. Total precipitation varies from 1,600 millimetres (63 in) on the mountains of the Sea of Japan coast to around 800 millimetres (31 in) (the lowest in Japan) on the Sea of Okhotsk coast and interior lowlands and up to around 1,100 millimetres (43 in) on the Pacific side. Although there is some light industry (most notably paper milling and beer brewing) most of the population is employed by the service sector. In 2001, the service sector and other tertiary industries generated more than three-quarters of the gross domestic product. However, agriculture and other primary industries play a large role in Hokkaido's economy. Hokkaido has nearly one fourth of Japan's total arable land. It ranks first in the nation in the production of a host of agricultural products, including wheat, soybeans, potatoes, sugar beet, onions, pumpkins, corn, raw milk, and beef. Hokkaido also accounts for 22% of Japan's forests with a sizable timber industry. The prefecture is also first in the nation in production of marine products and aquaculture. Tourism is an important industry, especially during the cool summertime when visitors are attracted to Hokkaido's open spaces from hotter and more humid parts of Japan and other Asian countries. During the winter, skiing and other winter sports bring other tourists, and increasingly international ones, to the island. Hokkaido is home to one of Japan's three Melody Roads, which is made from grooves cut into the ground, which when driven over causes a tactile vibration and audible rumbling transmitted through the wheels into the car body. Hokkaido has relationships with several provinces, states, and other entities worldwide. As of January 2014, 74 individual municipalities in Hokkaido have sister city agreements with 114 cities in 21 different countries worldwide. The current governor of Hokkaido is Harumi Takahashi. She won a fourth term in the gubernatorial election in 2015 with centre-right support. Her first election in 2003 in a close race against centre-left supported Yoshio Hachiro and seven other candidates ended a 20-year streak of victories by Socialist Party heavyweight Takahiro Yokomichi and then his former vice governor Tatsuya Hori who beat Hideko Itō twice by large margins. Itō, a former Socialist Diet member was supported by the Liberal Democratic Party against Hori in 1995 (at the time, Socialists and Liberal Democrats formed the ruling "grand" coalition on the national level); In 1999, Hori was supported by all major non-Communist parties and Itō ran without party support. Before 1983, the governorship had been held by Liberal Democrats Naohiro Dōgakinai and Kingo Machimura for 24 years. In the 1971 election when Machimura retired, the Socialist candidate Shōhei Tsukada lost to Dōgakinai by only 13,000 votes; Tsukada was also supported by the Communist Party – the leftist cooperation in opposition to the US-Japanese security treaty had brought joint Socialist-Communist candidates to victory in many other prefectural and local elections in the 1960s and 1970s. In 1959, Machimura had defeated Yokomichi's father Setsuo in the race to succeed Hokkaido's first elected governor, Socialist Toshibumi Tanaka who retired after three terms. Tanaka had only won the governorship in 1947 in a run-off election against Democrat Eiji Arima because no candidate had received the necessary vote share to win in the first round as required by law at the time. The Hokkaido Prefectural Assembly has 101 members from 47 electoral districts. As of April 30, 2015, the LDP caucus holds a majority with 51 seats, the DPJ-led group has 26 members. Other groups are the Hokkaidō Yūshikai of New Party Daichi and independents with twelve seats, Kōmeitō with eight, and the Japanese Communist Party with four members. General elections for the Hokkaido assembly are currently held together with gubernatorial elections in the unified local elections (last round: April 2015). ^ McClain, James L. (2002). Japan, A Modern History (First ed.). New York, N.Y.: W.W. Norton & Company. p. 285. ISBN 978-0-393-04156-9. ^ Ossenberg, Nancy (see reference) has the best evidence of this relationship with the Jōmon. Also, a newer study, Ossenberg, et al., "Ethnogenesis and craniofacial change in Japan from the perspective of nonmetric traits" (Anthropological Science v.114:99–115) is an updated analysis published in 2006 which confirms this finding. ^ Nakamura, Akemi, "Japan's last frontier took time to tame, cultivate image", The Japan Times, 8 July 2008, p. 3. ^ McDougall, Walter A. (1993). Let the Sea Make a Noise, pp. 355–356. ^ "Chapter VII: 1945". The Official Chronology of the US Navy in World War II. Hyperwar. Retrieved 20 September 2011. ^ "Translation of Message from Harry S. Truman to Joseph Stalin", August 19, 1945, History and Public Policy Program Digital Archive, RGASPI Fond 558, Opis 11, Delo 372, Listy 112–113. Translated by Sergey Radchenko. http://digitalarchive.wilsoncenter.org/document/122333. Retrieved 2017 September 22. ^ "Ainu Mosir. The land of human beings – Nanni Fontana – photographer". Nanni Fontana. Archived from the original on 2012-04-11. Retrieved 2012-09-14. ^ July.04.2008 (2008-07-04). "ICU Students Support Indigenous Peoples Summit in Ainu Mosir 2008 « ICU BackNumbersite". Web.icu.ac.jp. Archived from the original on 2013-06-24. Retrieved 2012-09-14. ^ "Indigenous Peoples Summit in Ainu Mosir 2008 * News". Win-ainu.com. Archived from the original on 2013-11-07. Retrieved 2012-09-14. ^ Lewallen, Ann-Elise (November 30, 2008). "Indigenous at last! Ainu Grassroots Organizing and the Indigenous Peoples Summit in Ainu Mosir". The Asia-Pacific Journal: Japan Focus. 48-6-08. Retrieved September 14, 2012. ^ Okada, Mitsuharu Vincent (2012). "The Plight of Ainu, Indigenous People of Japan" (PDF). Journal of Indigenous Social Development. University of Hawaii. 1 (1): 1–14. Retrieved September 14, 2012. ^ "National Museum of Ethnology, Japan: Permanent Exhibitions". Retrieved 2011-08-26. ^ "M 6.6 - 27km E of Tomakomai, Japan". United States Geological Survey. Retrieved 6 September 2018. ^ "General overview of area figures for Natural Parks by prefecture" (PDF). Ministry of the Environment Japan. 31 March 2008. Retrieved 2009-06-02. ^ Hirata, Daisuke; et al. (2013). "Molecular Phylogeography of the Brown Bear (Ursus arctos) in Northeastern Asia Based on Analyses of Complete Mitochondrial DNA Sequences". Mol Biol Evol. 30 (7): 1644–1652. doi:10.1093/molbev/mst077. PMID 23619144. Retrieved 18 March 2015. ^ a b "Hokkaido's Business Environment". Trade and Economic Exchange Group, Commerce and Economic Exchange Division, Department of Economic Affairs, Hokkaido Government. Archived from the original on 2010-07-21. Retrieved 2008-12-05. ^ Takahara, Kanako (July 8, 2008). "Boom time for Hokkaido ski resort area". The Japan Times. The Japan Times Ltd. Retrieved 2008-09-27. ^ Johnson, Bobbie (13 November 2007). "Japan's melody roads play music as you drive". The Guardian. Farringdon Road, London, England: GMG. p. 19 (International section). Retrieved 2008-10-20. ^ "Your car as a musical instrument – Melody Roads". Noise Addicts. 29 September 2008. Retrieved 20 October 2008. ^ "Exchange Affiliates" Archived 2015-05-24 at the Wayback Machine. Retrieved on 5 December 2008. ^ a b c d "Hokkaido – Alberta Relations" (PDF). Archived from the original (PDF) on 2010-12-04. Retrieved 2010-05-30. ^ "Alberta Sport, Recreation, Parks & Wildlife Foundation". Archived from the original on 2011-10-28. Retrieved 2010-05-30. ^ "Massachusetts Hokkaido Association". Retrieved 2010-05-30. ^ "MOU of the Establishment of Friendship between Province of Chiang Mai and Prefecture of Hokkaido" (PDF). Retrieved 2018-12-29. 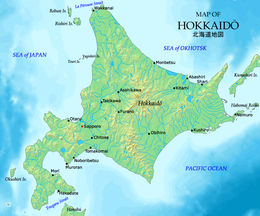 Wikimedia Commons has media related to Hokkaido. Wikivoyage has a travel guide for Hokkaido.